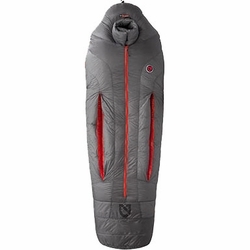 NEMO Canon -40 Sleeping Bag. The Canon™ allows for temperature regulation, improving your sleep under a wider range of conditions. No other mountaineering bag offers the same comfort from base camp to summit. Contrast color Arm zips open from the inside and outside of the bag. The Stove Pipe™ Tunnel Hood, insulated with PrimaLoft, keeps a pocket of warm air near your face so breathing is comfortable in the bitter cold. Zippered arm openings (Arm ZIps) and a central zipper location let you enjoy the comfort and warmth of Canon -40 while eating a meal or prepping gear. The entire exterior of Canon™ -40 is constructed from OSMO™ DT waterproof/breathable fabric to protect you and your down from frost and moisture build-up. Unique Toester Box™ construction reduces cold spots. Canon -40 is filled with premium 850 fill power down. These down clusters trap layers of air for natural insulation while high loft ensures warmth and compressibility.